Can you present in few words your company? Create since when, by who? Quadrofoil is a high-tech development company with a team of skilled engineers, nautical enthusiast and visionaries, who designed and manufactured the world's first fully electric powered and completely environmentally friendly personal hydrofoiling watercraft. The company was established in 2011 by a group of visionaries, inventors and overall nautical enthusiast. The Core Teams consists of Marjan Rožman, CEO and founder, Simon Pivec, R&D director and founder, Klemen Tavčar, Design director, Miloš Velimirovič, Design, Ermin Kosovel, Original concept design Q2. How became you this "crazy" idea of electric Quadrofoil? And can you explain the main difference between the models and their prices? The basis for our crazy idea was the final result itself; how to design and produce a vessel that will ECO friendly, energy-efficient, useful in all areas of water and with the lowest cost of ownership. The first problem which had to be solved was a large water resistance, which is the main cause of energy inefficiency seen in the majority of boats powered by internal combustion engines. We found a solution in rising the vessel above the water and placing it on wings and thus reduce the water resistance by 95%. Because of this, we were able to use electricity to power the vessel. Our designers have created an ergonomically advance and very attractive vessel, which is very similar to an automobile. Consequently, we also wanted to achieve maneuverability that is comparable to automotive handling. We achieved this by developing our patented control system, whose responsiveness and controllability is unmatched by any vessels in the marine industry. The main difference between the models in the battery capacity and engine strength. Future buyers will have an option to choose from a variety of additional equipment and build their own Quadrofoil Q2. Quadrofoil Q2A Electric with a 3.7 kW electric will be available from € 15.000, while the price for the stronger 5.5 kW Q2S Electric will start at € 22.000. What designer has labored and drawn this watercraft? Is this watercraft manufactured in Slovenia? The watercraft is mostly produced in Slovenia. This means that individual parts are provided by domestic and foreign partners. The whole Quadrofoil is then assembled in Slovenia. Please check the presentation of the Core Team in the first question to see the designers. How many units to you hope to sell in 2016 and 2017? Giving predictions is a rather difficult job. In 2016, our current predictions are to sell approx. 700 – 1000 Quadrofoils. But in general we hope to sell as many Quadrofoil as we can produce. So far owner and dealership request far surpass our production capacities. This is also the main reason why we decided to invest in our own production facilities (you can find the Press Release here: http://bit.ly/1l60S4j). 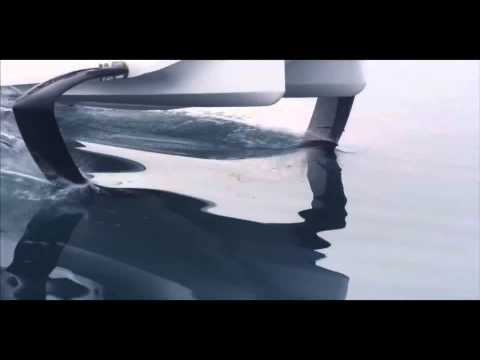 But our objective is not just to sell; with Quadrofoil being the world's first fully electric and completely environmentally friendly personal hydrofoiling watercraft, we believe that we are starting a (r)evolution of the boating industries and are significantly helping our planet to stay healthy and clean. Is this watercraft homologated for all the countries? Is your website the only way to order it? Quadrofoil is currently in the process of a conformity assessment. Unlike the U-boat Worx HP Sport Sub 2 that’s designed to outperform octopi under the water, the Quadrofoil has been developed to provide hydrofoil performance above it. When Gizmag first reported on the Quadrofoil back in 2012, the Slovenian craft was still in its prototype stages, but now it’s ready for production and available for global pre-order. The radically finned Quadrofoil is described as a hydrofoiling personal watercraft (PWC), but unlike other PWCs the Quadrofoil produces marginal noise pollution, zero emissions, and creates only the tiniest of waves. As a result, the company claims the quad-finned watercraft could in theory access more environmentally sensitive areas where noise and wave disturbances are prohibited. Available in two models and capable of carrying two adults, the Quadrofoil, without foils attached, takes up 1.5 m (5 ft) from side to side, while standing 1.2 m tall (4 ft) and measuring just under 3 m (10 ft) in length. The Q2S has a 5.5 kW motor and longer lasting 10 kWh batteries and is said to be good for a top speed of 40 km/h (21 knots) above the water. The cheaper Q2A gets its power from a QE 3.7 kW electric motor and 4.5 kWh batteries and tops out at 30 km/h (16 knots). The company reports a full charge in 2 hours and a range of 100 km (54 nautical miles) for the Q2S model, while the Q2A’s range is cut in half to 50 km (27 nm). Using C-foil technology, the Quadrofoil's specially-shaped water wings provide the necessary lift forces to get the craft out of the water at only 12 km/h (6.5 knots). Made of composite materials and weighing in at only 100 kg (220 lb), the craft is relatively light and the designers claim it is unsinkable thanks to its hollow hull construction.